Delhi-born, Mumbai-based artist Reena Kallat reflected on her studio practice, which involves simultaneous contemplation of multiple materials, structures, and concepts to re-code various experiences into meaningful forms, all at different stages of completion. Her projects often employ painting, photography, video, sculpture and installation for a single work. Frequently, she works with officially recorded or registered people, objects, monuments, and events that are lost or have disappeared without a trace, only to get listed as anonymous and forgotten statistics. Reena elaborated on one of her beautiful and moving pieces: “Light leaks, winds meet where the waters spill deceit” (2010), a sculpture made of metal, thread, fly zapper with UV fluorescent tubes and electrified grid, modeled on the gates that demarcate the boundary between India and Pakistan at the Wagah Attari border. 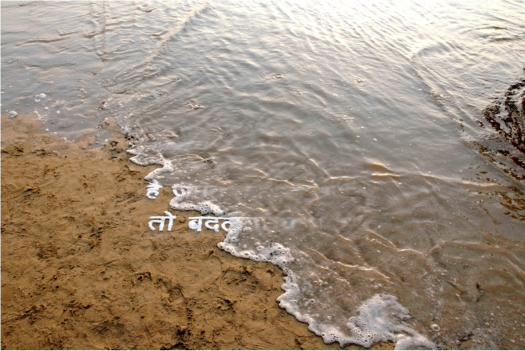 In a recent text-based series “Saline Notations” (2013), Reena used salt as a medium to explore preservation concepts, and the tenuous yet intrinsic relationship between the body and the oceans. Reena Saini Kallat (born 1973, Delhi, India) graduated from Sir Jamsetjee Jeejebhoy School of Art, Mumbai in 1996 with a B.F.A. in painting. Her practice – spanning painting, photography, video, sculpture and installation, often incorporates multiple mediums into a single work. She frequently works with officially recorded or registered names of people, objects, and monuments that are lost or have disappeared without a trace, only to get listed as anonymous and forgotten statistics. One of the recurrent motifs in her work is the rubber stamp, used as an object and an imprint, signifying the bureaucratic apparatus, which both confirms and obscures identities. Her work has been widely exhibited across the world in venues such as Mori Art Museum, Tokyo; Kennedy Centre, Washington; Saatchi Gallery, London;SESC Pompeia and SESC Belenzino in Sao Paulo; Goteborgs Konsthall, Sweden; Helsinki City Art Museum, Finland; National Taiwan Museum of Fine Arts;Tel Aviv Museum of Art, Israel; National Museum of Contemporary Art, Seoul;Arken Museum in Denmark; Henie Onstad Kunstsenter, Oslo; Casa Asia, Madrid and Barcelona; ZKM Karlsruhe in Germany Campbelltown Arts Centre, Sydney; Hangar Bicocca, Milan; Museum of Contemporary Art, Shanghai;IVAM Museum, Spain; Busan MOMA; Kulturhuset, Stockholm; Chicago Cultural Centre amongst many others while closer home she’s shown at the Dr. Bhaudaji Lad Museum and the NGMA, Mumbai. Reena Kallat, Saline Notations, 2014 digital prints on Hahnemuhle Photorag archival paper 23 x 33 in. l 58 x 84 cm each.